Little Wonder | Alpine Products, Inc.
Little Wonder blowers are the best-designed blowers in the world… Known for unmatched leaf-blowing efficiency! Durable, solid-steel construction…they’re built to last! 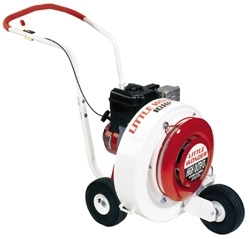 Little Wonder Optimax blowers outperform the competition for moving stubborn debris, removing standing water, preparing asphalt or flat roofs for resurfacing, or for any job that requires hurricane-force air. – Patented set-and-forget air deflector, movrd debris piles quickly and efficiently. No need for continual adjustment by operator. – Ergonomic Handles are height adjustable and designed with anti-vibration grip. – Computer Designed Impeller with reversed inclined blades to dramatically increase air output. – 12″ Pneumatic Rear Wheels; 10″ Pneumatic Front Wheels. All models feature flat- resistant, large tubed tires for ease of pushing and maneuverability, even on rough, uneven ground or asphalt. – Curved Aerodynamic Inlet draws air in smoothly around the entire inlet area. the design results in constant power even if leaves are drawn into the inlet, avoiding clogging. – Durable Blower Housing is continuously welded heavy gauge steel for strength and durability. Larger housing discharge for optimum air flow. – Lift Handle makes lifting the blower on and off the truck easier. – Economical, commercial engine runs cooler. The Little Wonder Optimax Maximum Output Blower is designed for maximum leaf blowing intensity! Our engineers developed this blower through extensive air flow analysis and rigorous field testing. The result was a housing and fan combination that delivers unmatched debris handling performance.